MUNICIPAL STADIUM (Hagerstown, MD) - The Lexington Legends traveled to face the Hagerstown Suns in the first of a three-game series and fell, 6-5 in game one. The Legends now fall to 57-46 overall (20-16 in the second half) and remain in second place in the Southern Division of the South Atlantic League. The Suns got on the board in the bottom of the second inning. Omar Meregildo homered to center field and Hagerstown led, 1-0. In the bottom of the fourth inning, Meregildo doubled to left field then scored on an RBI single by Phil Caulfield and the Suns extended their lead, 2-0. The Legends scored their first runs of the game in the top of the sixth inning. Carlos Diaz hit a ground ball to left field then moved to third on a single by Kyle Isbel. Cristian Perez grounded out to the second baseman, allowing Diaz to score. Nick Pratto then doubled home Isbel and the game was tied, 2-2. Hagerstown answered in the bottom of the sixth inning. Jake Scudder singled to left field to lead off the inning. Alex Dunlap then blasted a two-run home run putting the Suns back on top, 4-2. In the top of the eighth inning with two outs, Armond Upshaw hit a ground ball to the third baseman, Jeison Guzman who committed a fielding error. Gage Canning then drew a walk, putting two runners on the base path. 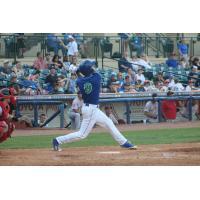 Scudder smacked a two-run single to center field and Hagerstown continued to lead, 6-2. The Legends attempted their comeback in the top of the ninth inning. Seuly Matias reached on a fielding error by Hagerstown's third baseman then moved to second on a single by MJ Melendez. Both runners advanced on a wild pitch by Connor Zwetsch. Guzman then grounded out to the shortstop, and Matias scored. With Melendez still on base, Cal Jones hit a two-run homer to center field and the Legends pulled within one run, 6-5. The Suns were then able to record the final out of the game to take game one of the series. Brigham Hill earned the win for the Suns, pitching 6.0 innings allowing two runs on seven hits while striking out one. Garrett Davila was given the loss for the Legends, tossing 4.0 innings allowing four runs (two earned) on six hits while walking six and striking out five. Lexington and Hagerstown will meet for game two tomorrow, July 31 at 7:05 p.m. The Legends will send LHP Daniel Lynch (2-0, 1.93 ERA) to face RHP Tomas Alastre (4-5, 4.99 ERA).